Robert Green lost his mother and granddaughter in the floods, and now he is on a search to recover their bodies. NEW ORLEANS, Louisiana (CNN) -- Robert Green had the same message for every official he met in the flood and the days after. "My momma's body is on the roof at 1617 Tennessee Street," he told police officers, members of the National Guard, Red Cross workers and federal emergency workers. He'd been saying that since August 29 when Green, and his brother left the corpse behind to help save survivors of their New Orleans household from Hurricane Katrina. The tax accountant hoped that providing authorities with a precise location would hasten the recovery of Joyce Hilda Green's remains and that of his toddling granddaughter, Shenae, 3. It hasn't. The state's recovery operations are over. Yet like hundreds of families who might never know what became of their relatives who died during the storm and its aftermath, he and the rest of the Green family are waiting for the day they will be able to bury Joyce and Shenae. They may never get the chance. "Unfortunately, the condition in which we're finding our individuals eliminates any chance of a visual identification because of the condition in which they've been for so long -- ... in the water ... in their houses ... in the horrible muck," Louis Cataldie, Louisiana's emergency medical response director, said recently. As of last week, Louisiana officials had identified just 200 of the more than 1,000 people killed in Hurricane Katrina. Green, 50, went back recently to the Lower 9th Ward -- thinking he'd succeed where recovery workers and morgue contractors have failed. "I thought I could come down here and move a branch, look under some wood, and find her body," he said. The yards-high heap of timber doesn't look like it's been searched, and Green fears that Shenae's little body is somewhere in that pile. So far, however, he has not found either his mother or his granddaughter. He and five of his family members have traveled to Baton Rouge to provide DNA samples. They said they know that pictures won't be enough to find their dead. 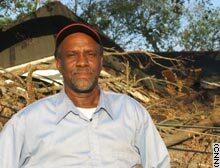 The floodwaters demolished Robert Green's neighborhood, leaving debris scattered in trees. Shenae and her great-grandmother died in the dark morning hours before Katrina came ashore. Green said a barge crashed through a cement floodwall and sent 20-feet of water into his neighborhood. That flood ripped the family's one-story blue house from its foundation on Tennessee Street -- three blocks from the Intracoastal Canal. As water chased them into their attic, Green and his brother - Jonathan Green -- kicked out a hole between the rafters. The two dragged five helpless people behind them: their 73-year-old Parkinson's-stricken mother, a 51-year-old cousin with the mental capacity of a first grader and Robert's three tiny granddaughters - Sheniya, 2, Shenae and Shemiya, 4. 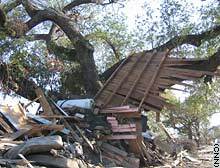 The raging waters stripped off some of their clothes and shredded their floating wooden house as they scrambled from housetop to truck roof to housetop. "We had one grandbaby with no clothes on," Robert Green said. "My sweatshirt got caught on a nail and I was about to go under when the house broke up so I tore that off. My shoes were washed off. The baby's Pamper and pants washed off ... while we were trying to deal with this current." During one of the transfers, Joyce Green and Shenae fell into the flood. The brothers managed to pull their mother up and resuscitate her, but she died later, Robert said. The baby plunged into the churning murkiness and never resurfaced, Green said. He thinks her tiny body became snared on the parts of splintered houses, trees or floating cars. Hours later, after the storm roared over them, a neighbor took the surviving Greens to the Claiborne Street bridge. From that elevation, Green said he could still see his mother's lean frame in grey pants and a green shirt stretched on the shingles. The body's prominent placement, he said, should have led someone to recover her remains early in Katrina's aftermath. "You couldn't come into the 9th Ward, you couldn't come across that bridge without seeing her," he said. Every place Robert Green wound up -- the Superdome, the Astrodome, a Tennessee hospital, Red Cross aid centers -- he asked where he could find information about Katrina's dead. But for weeks, all he found was confusion, delays and wrong information. "You couldn't reach FEMA because FEMA's recording always said they were too busy and to call back. And that went on for probably five days," Green said. "I just have pages and pages of numbers where you call to try to find out about the dead and it turns out not to be the right person or you get a message that the phones weren't working or if you get through then it wasn't the right number." Robert's call to another wrong number he received - a chiropractic association - produced information on the Find Family Call Center, which is the correct agency to locate the remains of Katrina victims. The Greens hope the runaround will end soon. "We had all of her X-rays, some blood samples," said Joyce's son David Green. "I'm not sure why it's a four or five week process. There are not that many women who are 6'1'' with one inch of hair on their head." Robert Green said he will maintain his resolve in finding the bodies. "They keep telling me I'm gonna break down from it, but until I bury my mother, I have nothing to break down for," he said. "I won't break down, and I can't break down, not until it's over."